As part of my interest in low-tech cooking I’ve wanted to build a rocket stove. Last summer I spent time at a lake cabin with a beach fire ring made of cement blocks. The gentle on-shore breeze inspired me to try making a forced ventilation rocket stove with the cement blocks. The base was a V of solid blocks. The V was topped with more solid blocks. The chimney sat above the point of the V, and was two 8×8″ hollow cement blocks. I chinked gaps between the blocks with piles of dry sand. I only got to play with it one afternoon, but it worked quite well. I used flotsam on the beach for fuel, mostly 1/2″ diameter stuff. The fire really roared and was quite smokeless. Several hours after the fire was out I returned to dismantle things and burned myself on the still hot blocks. This entry was posted on December 7, 2010 at 4:33 am and is filed under Fire. You can follow any responses to this entry through the RSS 2.0 feed. You can leave a response, or trackback from your own site. 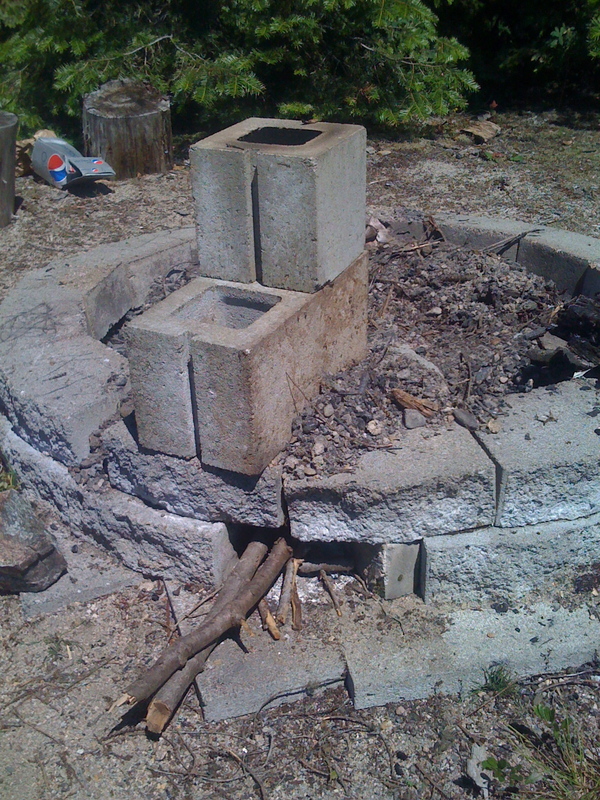 They made a rocket stove from 5 cement blocks and it burned well, like over 600 degrees F. However, cement will, apparently, degrade at such temperatures eventually (???). It’s discussed in that thread.